I happen to live in the general vicinity of where Lewis and Clark set forth on their “corps of discovery” up to the Missouri headwaters back in the early 1800s. Today I want to tell you about my own discovery voyage that I begin today, to visit my mother’s ancestral grounds in northeast Poland with my sister. I first thought about this trip several years ago when I came across a distant cousin living in Tel Aviv. Cousin Ori had mapped out my entire maternal family tree on Geni.com, spending countless hours tracking down relatives going back into the 1800s. At the time that we were first introduced, I had no idea that he even existed. But I am grateful for his efforts, especially in re-kindling this quest that I am on this week. My grandfather came to the States about 100 years ago, and lucky for him he did. Almost all of his contemporaries perished in the Holocaust, including his father. They came from a small Polish town called Zambrow (also spelled Zembrov and other combinations as well) of a few thousand people. That is where my sister and I are headed, along with seeing the larger cities of Poland too. So consider this my first report of my travels. I am lucky that I am going now when it is relatively easy to do online research and find out things such as tourist sites, maps, train schedules, reservations for AirBnBs, and the like. The more I did the research, the more excited I have gotten about our trip. Right now I am just trying to manage my expectations. But there was plenty to find online to whet my discovery appetite. 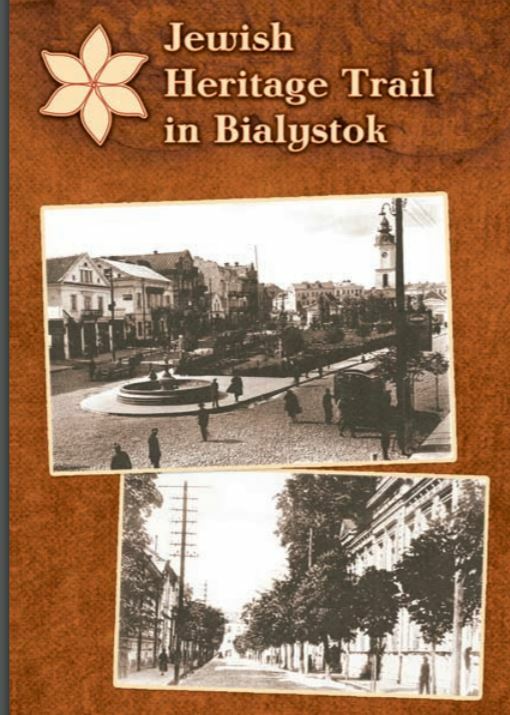 For example, here is a brochure for Jewish sites in and around Bialystok, one of the places we are visiting. For those who are interested, many of the smaller European towns which had significant losses during WWII produced these hard-copy memory books that documented all of those who once lived there. Here is the history of these books, and the community associations that created them called landsmanshafts. The book for Zambrow can be found here, and right on p. 167 is my relative, Shabtai or Shepsl Kramarsky, who was a rabbinic judge 100 years ago. When my grandfather came to the States, he shortened his last name to Kramer, which was very common as the Ellis Island authorities had long lines of people and not much patience with all those syllables. One of the things I love about Jewish geography is how small a world it really is. In addition to finding cousin Ori, one of my most faithful readers is Hank Mishkoff, who visited Zambrow almost 20 years ago and posted his travels here. He is putting me in touch with some folks that he knows in Poland, and we’ll see what happens! Heritage is a part of everyone’s life. We are shaped by our own view of ourselves making it important to understand and study our ancestors. Thank you for sharing your adventures… may you find rich treasures! That is so cool! I danced for five years with Janosik, a Polish performing troupe in Philadelphia, and have a great affinity for Polish culture. Are you learning any Yiddish? Is it spoken at all in the Polish Jewish communities? At one time it was the universal language of all Polish and Russian Jews. Probably the only language that can adequately describe Donald Trump. Thanks all of you that emailed and posted comments. So far we have been to Warsaw and Krakow, and have gotten to see some amazing places, both Jewish and non. First, the http://1944.pl museum was very worthwhile. The 3D movie gave us a good perspective on what happened during the August 1944 revolt against the Nazis and how much of the city was either leveled or at least partially destroyed. It is hard to believe that pre-war this was an active place with 1.3M residents. Today it is a shadow of that, and the 300K Jews are down to around 3K. We were staying around the corner from the one remaining synagogue from that era which for some reason wasn’t bomed. They were just getting started with Sabbath services when we visited. It is nice to see that no matter how hard the Germans tried, there is still a Jewish life here. Carrie’s luggage was lost by her airline — both of our initial flights were cancelled but we managed to arrive in Warsaw a few minutes apart from each other anyway. So last night we were at the new shopping mall across from the central train station, where she got a few things to tide her over — luckily I brought enough warm clothes for both of us! Then on to Krakow. We tried to get tix for Auschwitz ahead of time but their website is somewhat vexing. I thought that we wouldn’t have a problem, given the number of tour groups being run from K. that we could find a tour but when we got here we were told all the tours were sold out. We took our chances on just showing up early and luckily that strategy worked. (There are 4 public bus companies that run frequent service from the main bus station, so it easy to get out there.) We spent about 4 hours walking around, reading the various exhibits and moving from Auschwitz to Birkenau, which is a few miles away. Each barracks has been renovated as a different museum exhibit that pertains to that country’s victims, and all were very moving. In front of one of the buildings was an Orthodox Jewish family from NYC with the patriarch holding forth on his experiences. We stayed with them for a bit listening to his stories, as he has been to camp numerous times and gives tours to Jewish groups quite often. One of the things that I learned was that Italy had its own collection of camps — I guess I never thought about that. Another was from an exhibit on the construction of the crematoria by a German engineering firm Topf and Sons. It was clear from the documents shown in this exhibit how complicit they were in this process and how cooperative they were in designing the ultimate killing machines used at the camps. How anyone can deny that these events of the Holocaust took place is beyond me. The horrors of the place are made even more so because you are actually there. The crumbling structures make it feel even more intense. In this brochure linked to this page above, you can see something interesting: The original engineering plans were unavailable for many years because the archives were purchased from a leading Holocaust denier. When he reviewed the plans, he eventually came around to accept the reality of what happened. Monday we walked around the Jewish Quarter of Krakow, which is somewhat of a misnomer as there aren’t any Jews living there now although their presence is very strong: there are numerous synagogues within a few blocks of each other, and remnants of places where they lived and owned businesses. That area of the city isn’t as renovated as other parts, although it does seem to be making a comeback. One tour guide told us that the Spielberg “Schindler’s List” movie was a big economic engine that began in the mid-1990s after the movie came out. While it has taken time for this development to get started it can be seen as a lot of construction is happening and the area now has a solid bar/club scene which is always a sign that the neighborhood is on the way up. At the local flea market, one table was filled with Nazi memorabilia. Not sure if genuine or reproduction, but either way somewhat unsettling. Schindler’s actual metalworking factory featured so famously in the movie is actually across the river from this area, and is now a museum (http://www.mhk.pl/branches/oskar-schindlers-factory). We tried to get in to see it on Monday, but the line was too long (whether because it is free admission that day or because of Yom Ha Shoah). We were able to see it on Weds. by getting their right as they opened. The museum is interesting — there is just a couple of rooms documenting its original purpose and paying homage to the live of its namesake. The exhibits document the original invasion of Krakow by the Nazis in the early part of WWII and how quickly they established control over the city and created the Jewish Ghetto. The number of artifacts from the wartime activities, the photos of both Polish and Germans involved, and street scenes were overwhelming. I particularly liked the art projects that were created as contemplative spaces, and reminded me of the large Serra sculptures that put you inside of them. If Krakow has any downside, it is because it attracts too many tourists and the infrastructure just can’t support the hordes. The vast majority of tourists come there as part of groups and so the big attractions, such as the salt mine, Schindler’s factory and Auschwitz have to cater to them, leaving little opportunity for independent travelers such as Carrie and I to get into these attractions. I guess this is a good problem to have but it means if you want to see these sites you need to plan a lot further ahead than we did. If you are thinking of going to Poland to try to find your own roots and don’t want to join a tour group. here are some resources that I found helpful online. There are dozens more. Information for the English-speaking Jewish tourist in Warsaw is an excellent guide that covers all sorts of practical information, where to find Kosher food, the sites that aren’t necessarily mentioned in the main guides, and how to get around the city independently. The Jewish Heritage Trail in Bialystock. Covers the major structures (some still standing, some long gone) and who lived there back in the pre-WWII era. Bialystok is two hours by train from Warsaw and a charming small city. You will want to also download the map and use Google Maps to help you navigate — it is easy to miss many landmarks. This guide was written by someone who has traveled independently and is filled with many practical suggestions on how to do so at Aushwitz. I agreed with many of his suggestions, esp. on the pros and cons of independent vs. group travel. Train schedules: http://intercity.pl/en The major intercity train interactive schedule page. You can also purchase tix online too. http://SeeKrakow.com and https://discovercracow.com are the two major tour operators of the dozens there. We went on a Discover Krakow salt mine tour and it was excellently run. There are numerous tour operators in the city, but be careful dealing with people who approach you on the street.